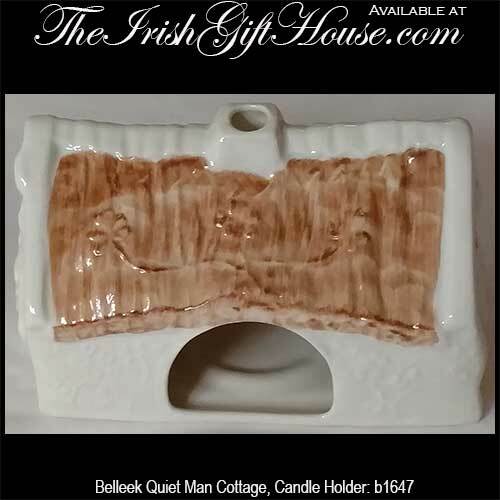 Belleek Quiet Man Cottage candle holder features hidden shamrocks and is illuminated with a tea light. 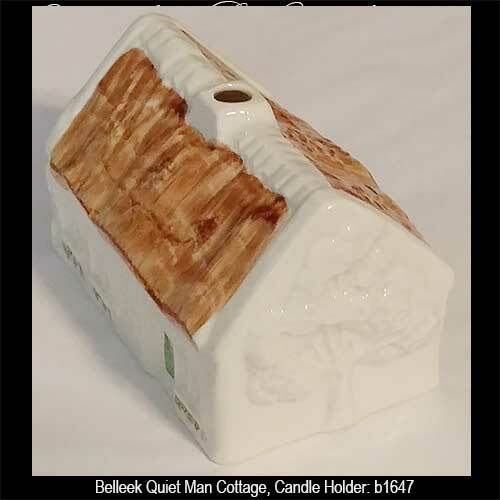 The Belleek Quiet Man Cottage was introduced as the 2014 edition piece. This fine china Irish candle holder from Belleek is the Quiet Man Cottage that features a hand painted thatched roof with hidden shamrocks. The Belleek candle holder is enhanced with a green door and flowers along with embossed trees on two sides. Additional detail includes an embossed bicycle and vines. The rear wall has an opening for the included tea light candle and the open chimney serves as the vent. The Belleek China Quiet Man Cottage measures 5 1/2" long x 3 1/4" tall x 3 1/4" wide and it is hand crafted in Belleek, Ireland. The Belleek candle holder is gift boxed with a shamrock history card, complements of The Irish Gift House. 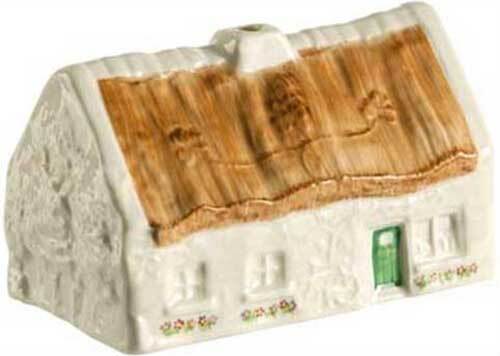 Belleek China candle holder is in the shape of an Irish thatched cottage. Belleek St. Patrick’s Church candle holder features hand painted shamrocks on fine china. Belleek candle holder features fine china that is pierced with shamrock openings along with an embossed shamrock lace motif.